As a child, I had never dreamt of my wedding dress, or how it would feel to be part of a big white wedding. I had, however, thought long and hard about the shoes! So, it could be none other than Manolo Blahnik’s white satin D’Orsays from Quincy in Woollahra. I wanted a simple, elegant silhouette for my gown and chose a beautiful Lisa Ho cap sleeve dress, with a custom Neil Grigg headpiece and veil. As a final flourish and nod to my love of fashion, I wore a purple Lisa Ho feather bolero when I felt the May chill. I carried a Lanvin clutch from Net-a-Porter which carried a piece of lace from my paternal grandmother’s wedding dress (something borrowed) and a Liberty handkerchief from my sister-in-law with Manolo Blahnik illustrations (something blue). 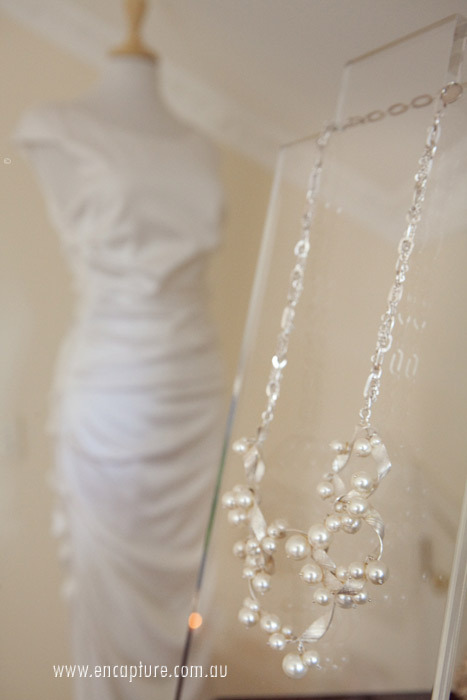 I had a Jayson Brunsdon necklace and some diamond and pearl earings, however after getting all dressed up, taking advice from Mademoiselle Channel, I removed the earings to save for the party dress…“before you leave the house take one thing off”. I always wanted my girls to feel comfortable and individual, a glamorous version of their everyday selves! After spying the gorgeous mountain print skirt from Lisa Ho on a shopping trip for myself, I knew I had found the base for the bridesmaids. I styled two of the girls in this skirt with a Lisa Ho lilac sleeveless blouse, each tailored to their individual style. 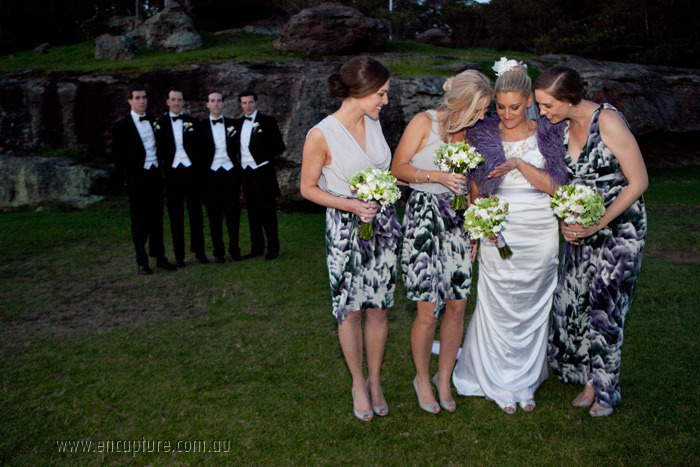 My third bridesmaid was 7 months pregnant at the time of the wedding. The mountain print fabric also came in a stunning floor sweeping gown. While we initially planned to shorten the dress to match the length of the skirts, once she had it on she truly glowed and looked, and felt, so beautiful in full length that we could not bear to cut it. True to my wishes, I think each of the girls looked unique, beautiful and relaxed. * The fantastic photographer that took these amazing photos is Carmen from Encapture Photography. She is absolutely fabulous – such a delight to work with, super professional and…well the photos speak for themselves! * Bride, bridesmaid & mother of the bride make up by the gorgeous and oh so talented Amanda Reardon who kindly stepped in at the last-minute for Charlotte Blakeney. Both are incredible at what they do. You can see Amanda’s work in the photos above and I was recently a bridesmaid (just 5 weeks after giving birth) where Charlotte did the make up and despite having to work with a puff-ball of a face she made me feel quite beautiful! 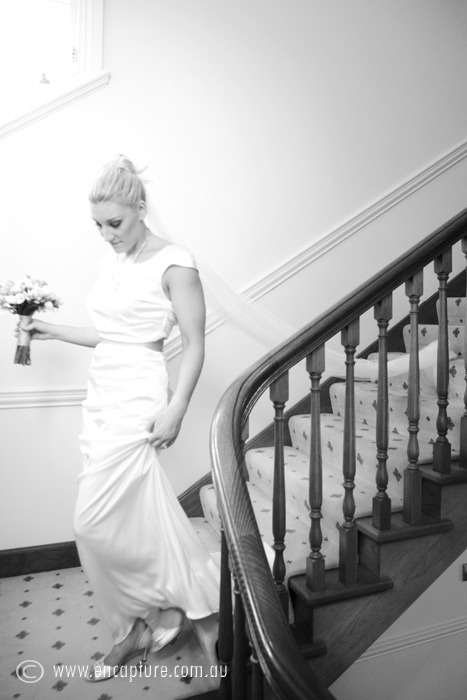 If you are after make up for a wedding its best to contact Charlotte as Amanda does not usually do weddings. 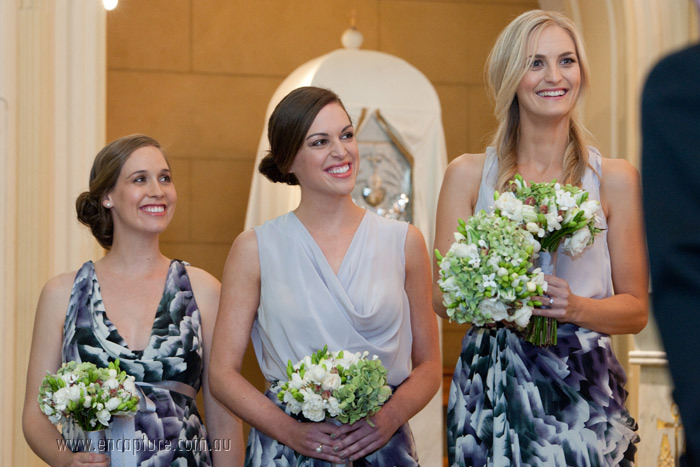 * Bride, bridesmaid & mother of the bride hair by Paloma and her very talented team at Oscar Oscar Paddington. * All ribbon – silk grosgrain, from Papier D’Amour. 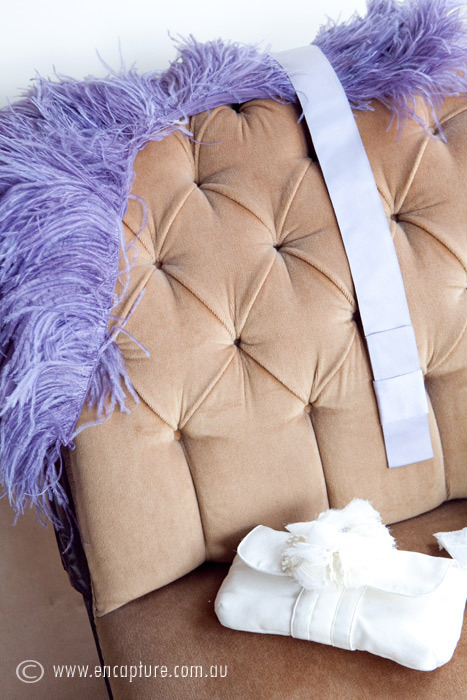 Further details on this gorgeous ribbon available in this related post. Other details set out within post.